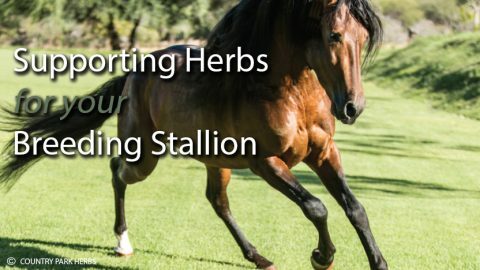 When it comes to using herbs to support your horse after smoke inhalation, one simple approach is to use herbs that support the respiratory and nervous systems to wet down feed with a delicious, soothing herbal tea. Mullein has a long history of helping with upper respiratory issues. It can help breathing difficulties by its soothing effect on the bronchioles. It soothes the respiratory tract and reduces mucus. Great for a scratchy throat from the smoke. Peppermint contains menthol, which is the main soothing ingredient in cough drops. It clears breathing passages, and soothes inflammation. That have been steeped for ten minutes in 3 to 4 cups hot water. Add all the herbs including water to the feed. With this amount of herbs you would make the tea in 4 to 6 cups of hot water, adding all the herbs and tea to the feed once or twice a day. You may choose to make your own blend from the selection below. Chosen specifically to soothe and cleanse following smoke inhalation, each herb’s particular properties are outlined to assist in your choice of blend. Chamomile – antispasmodic and useful with horses having trouble settling when you are trying to get things back to normal. Also useful with younger horses to help calm and reduce stress. If chamomile is steeped longer it is slightly bitter which will aid in digestion. Echinacea – immune stimulating herb, but it’s also wonderful at reducing inflammation in the entire body, decreasing chances of getting ill while under stress. Eyebright and Yarrow – astringent herbs that help irritated, inflamed tissues, mucus membranes and help to protect them and aid in healing, recovery and proper function. If your horse has irritated or weepy eyes, eyebright is specific and combines well with chamomile. Elecampane – an expectorant to help move foreign particles up and out of the lungs by helping the body produce mucus more effectively. Fenugreek – also an expectorant with an ability to thin mucous if it is too thick. Garlic -better added as a granule than a tea as an anti-microbial. If your horse shows any signs of getting a virus in general start using garlic at the first sign of a cold, flu or infection. Ginger -natural detoxifier and lung purifier. Not only does it contain chemical compounds that help the lungs function, ginger improves blood circulation. One teaspoon added directly into feed. Lemon Balm -anti-viral herb used to fight off viral infection or help to inhibit viral replication. Also a relaxing herb, restoring an anxious nervous system when your horses return home. Marshmallow root powder– demulcent that can coat and soothe irritated or inflamed membranes to allow healing to begin. Licoriceroot– a demulcent forprotecting the mucous membranes from excessive particulate matter. Adding the shaved licorice root to any tea will make it sweeter, helping fussier horses to indulge. Mullein – a lung tonicused to help with coughs and other respiratory issues because of its anti-inflammatory, antispasmodic, and expectorant properties. Nettles – decongestant to reduce congestion and mucus production. This can help reduce the possibility of an opportunistic infection. Rosehips– an antioxidantfor your horse’s immune system, as well as an aid in buildingcollagen with its vitamin c content. Shellcut rosehips make a nice textural additive to your tea mix. Turmeric– anti-inflammatory for reducing overall toxicity through its antioxidant compounds and reduces inflammation. Add one tablespoon of turmeric powder to each feed as part of your ‘get back to normal’ routine and it will help any injury suffered. White willow bark and Meadowsweet – two pain herbs that also have an astringent action on the respiratory airways and can help with pain relief. If needing any drug therapy from your veterinarian, revise your use of herbs. Some demulcents may block the absorption of oral drugs, garlic and turmeric can be contraindicated with some drugs, and some pain herbs are contraindicated with NSAIDS such as phenylbutazone. Enjoying a taste of your chosen blend before you serve your horse will probably mean your friend is going to enjoy it too.